After recording five top-five finishes but falling short of the winner’s circle in each tournament entering this week, the Stanford men’s golf team broke through with a resounding 10-stroke victory at the Western Collegiate in Santa Cruz. 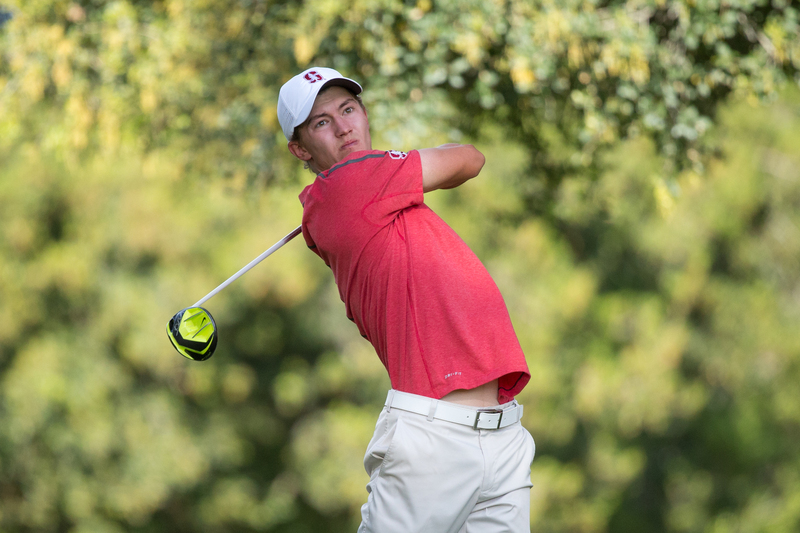 Junior Maverick McNealy (above) won his 10th individual title at the Western Collegiate, putting him one behind Patrick Rodgers and Tiger Woods for the program’s all-time record. The three-day, 54-hole tournament spanning Monday through Wednesday also saw a record-breaking performance from junior Maverick McNealy, who posted a 16-under 194 at Pasatiempo Golf Club to set the best score in tournament history, clearing the previous mark by five strokes. McNealy’s performance also secured him the tournament’s individual title as he came back from a shot down entering in the final day of play, shooting a 6-under 64 on Wednesday, including a scorching stretch of 5-under on holes 6-10. Oregon’s Aaron Wise, the tournament’s 18 and 36-hole leader, finished second with a 14-under 196, a mark good enough to break the previous tournament record but two strokes behind McNealy’s. McNealy’s individual title, the 10th of his collegiate career, leaves him just one behind the program’s all-time record of 11, jointly shared by Patrick Rodgers and Tiger Woods. In the tournament’s play-six-count-five format, the Cardinal finished as the only team under par with an aggregate score of 9-under. USC finished second at 1-over par while Oregon took home third-place at 9-over. In addition to McNealy, Franklin Huang and David Boote also posted strong scores in guiding the Cardinal to victory. Huang finished tied for eighth with a score of 1-under par while Boote, at even par, finished 12th. Freshman Brandon Wu (+6), junior Viraat Badhwar (+9) and sophomore Jeffrey Swegle (+9) also recorded top-50 finishes to round out the Cardinal’s 9-under team total. The tournament also concludes the regular season for Stanford, which will return to action on the weekend of April 29-May 1, during which it will seek to capture its third-consecutive Pac-12 title at The Country Club in Salt Lake City. Contact Vihan Lakshman at vihan ‘at’ stanford.edu.